Have you ever wanted to make your own video game? Well, now you can, sort of… Okay, well not really. But you can take your fantasy that little be further with Game Dev Story. You might not have an actual videogame to show for your time with Game Dev Story, but here you can play around with different concepts for a video game and hope it can be as successful as possible. The core gameplay loop of Game Dev Story primarily revolves around the conceptualisation of a video game and then getting your hand-picked development team to make that game for you as you make subtle inputs as the game is put together. 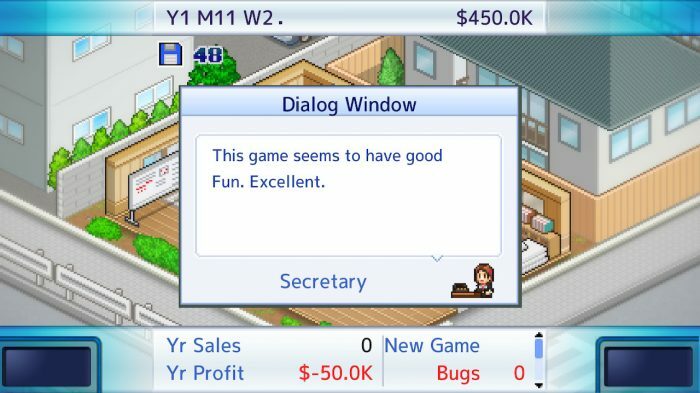 Once the game has been completed (and preferably bug tested) you can sit back and watch the money come in; hopefully, as your game might have received terrible review scores, which could have a negative impact on sales. Regardless of how your game does, essentially you repeat the same process again and again and again. Yet, in practise Game Dev Story is not a tedious exercise in boredom like it might sound. 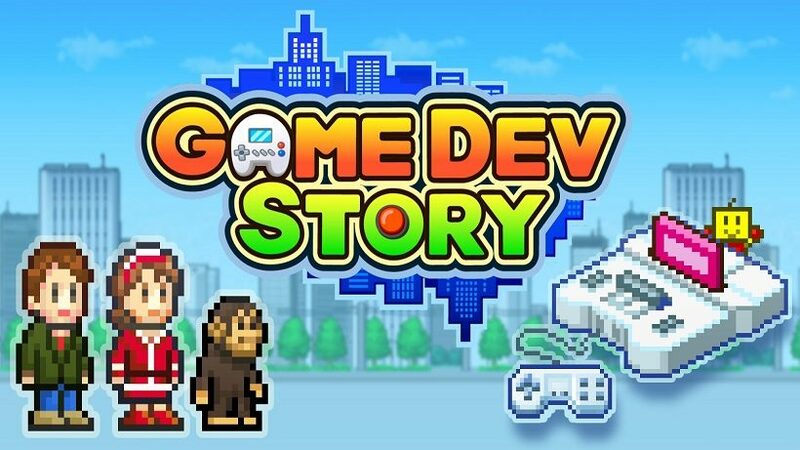 For those who are familiar with Game Dev Story from its arrival in the West on mobile devices (originally a Windows game in 1997) the game has been polished since then and is now a streamlined experience which lends itself to the repetitive gameplay loop that is present. This format works great on Switch, even whilst docked where the crisp visuals almost sparkle on the big screen. 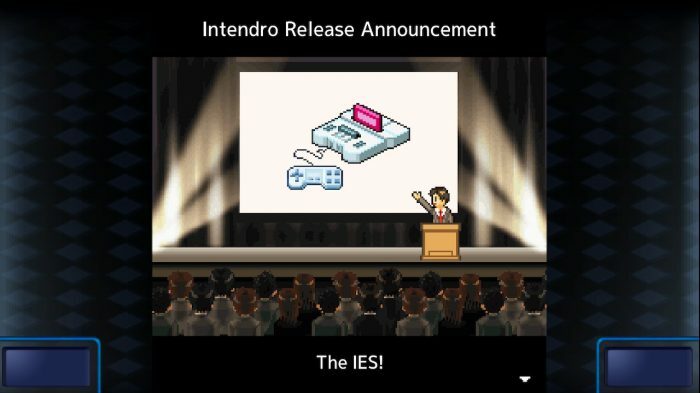 The totally original Intendro IES. No, you’re the one thinking of something else. It’s not just making video games though, as you can also take on contract work for other businesses, such as designing a team mascot or creating a scene for an anime. These are useful for bringing in additional money between projects and have deadlines by which they need to be completed. The pay isn’t as much as what comes from developing a game but are necessary early on to help generate the extra income required to pay the upfront development costs required. Unlike contract work which – as far as the game is concerned – is basically profit, there are a myriad of different cost contributed attributes. First, there is the one-off (and expensive) cost of getting the licence to develop for a system, then each console subsequently has a different cost to develop on per project. Contributing to this is the different game type and theme which each vary in cost; what determines the difference in cost is unknown, but they often happen to be the more popular ones. Whilst it is up to you what type of game you concoct, ultimately it is down to your team as to how good it ends up being. For a while, your games will be mediocre because so is your team. But as you level up your staff and bring in new more talented individuals – all of which at an additional annual cost – you will see improved results. This, of course, oversimplifies the process of video game development. The repetitive loop will not be for everyone, the main visual reward is the opportunity to expand to a bigger office, but the satisfaction of making and naming your own video game can be enough of a rewarding hook for others. 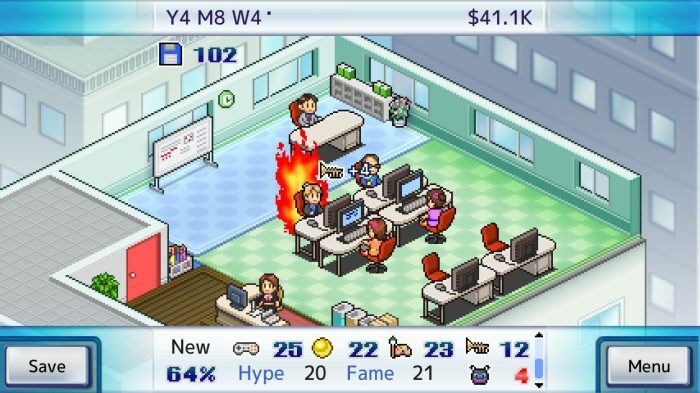 Game Dev Story might not satisfy the desire of making actual video games, but it is surprisingly good fun at playing with the idea. It has an addictive gameplay loop that has you saying, “just one more game”.